This is my message for today. So many times I think I need to muster up enough faith that God will work things out the way I have in mind. 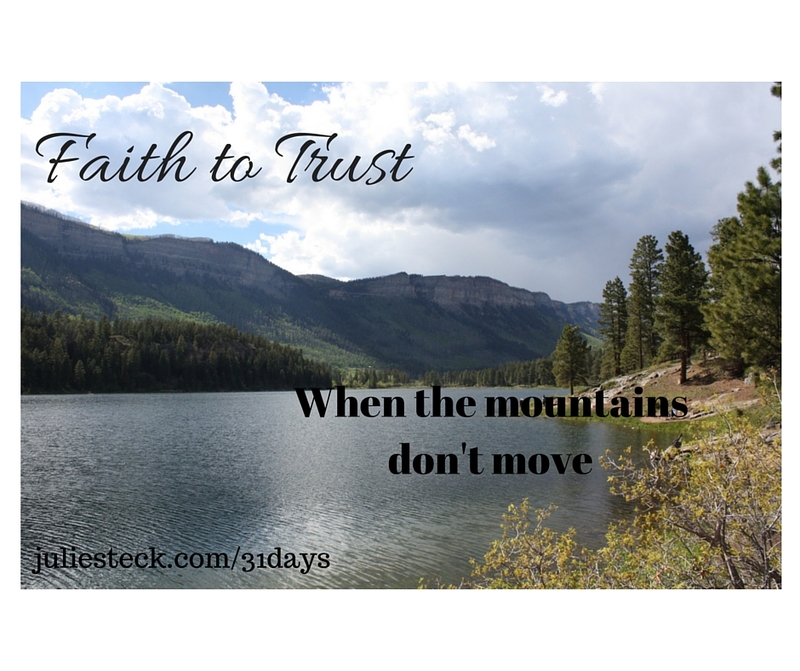 I hear Him asking me to have faith and trust Him even when He doesn’t move the mountains I want moved, part the waters I want to walk through, or give the answer I’m crying out for. This mountain in front of me may not move. These waters may not part. The answer may not come. Through it all, He remains the same. His words are True and He is Faithful. He may show me a new path around this mountain or give me tools to make one. He will give me faith to walk on the water or show me a route I never saw around the sea. He may show me the answer to what I’m seeking is right where I am. Thank you Father for your love. You know where we are. You know what hurts our hearts and where we need help. You know what the impossible mountain before every reader is. I pray you would draw near to us and we would draw near to you. I pray you would strengthen and increase our faith in You to not just hope it turns out the way we planned, but that we would trust You when it doesn’t. I pray we would find joy even when it doesn’t and you would use that opportunity to glorify yourself, for we are Yours. The sheep of Your pasture. And you are our Good Shepherd who laid down His life for the sheep. This post is part of a series through out the month of October called #write31days. To see the whole series and catch up, click HERE. Beautiful post Never heard this song before, either–thanks for sharing!